According to Community Affairs Coordinator Lee Yoakum, starting today, crews from Strawser Paving will begin maintenance on Winter Street in Delaware. Milling of Winter Street between Franklin Street and Central Avenue is scheduled to take place today through Oct. 12, while paving of the roadway is scheduled for Oct. 15-17 (weather permitting). During the maintenance work, the Winter Street bridge will be completed and opened. 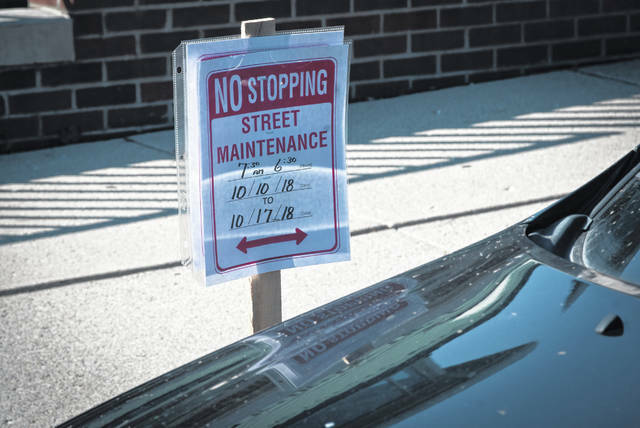 All traffic will be maintained during the repairs, and signs like the one pictured have been posted in areas where parking restrictions are in force. Street maintenance is highlighted annual in the city’s Capital Improvement Plan. After a sixth reading of the resolution at Monday’s Delaware City Council meeting, council members unanimously voted to approve the city’s new five-year Capital Improvement Plan (CIP) for years 2019-2023. The CIP was originally submitted to council on Aug. 15, but it was in need of a rebalancing by City Manager Tom Homan last month and resubmitted for approval. The plan highlights the city’s capital improvement general fund balances over the next five years, while also detailing a range of projects that could be completed in that time span. Prior to the rebalancing, a summary of the capital improvement general fund showed expected funds available for capital improvements after including revenues and subtracting the city’s debts to be $2,317,104 in 2019, $1,296,221 in 2020, $1,125,877 in 2021, $1,315,056 in 2022, and $1,740,544 in 2023. The approved CIP now shows projected balances of $2,452,784 in 2019, $1,947,749 in 2020, $2,017,832 in 2021, $2,328,675 in 2022, and $2,796,817 in 2023. With the rebalancing of the plan, deficits in the ending balance that did exist in the original submission for each year of the five-year plan now show positive balances of $129,281 in 2019, $104, 621 in 2020, $328,592 in 2021, $499,565 in 2022, and $654,610 in 2023. Under the plan, $3,217,688 is projected to be spent on street improvements over the five-year period, compared to the $3,466,120 that had been projected on the original CIP. Discussed further in the street improvements section of the plan is the much-anticipated reconstruction of The Point that would relieve much of the congestion along U.S. Route 36 and state Route 37 by adding a lane on both sides of the road. Extensive reconstruction of the Norfolk Southern Railroad bridge would also be done. The total cost of The Point project is estimated to be $25.2 million. The city has secured funding at both the state and federal levels that would cover 75 percent of the project, leaving the city with $6.4 million in local funding to contribute. The city’s report states it will continue to pursue additional grant money and funding opportunities to lower the city’s needed contributions. According to the report, the project is currently in the survey phase of both the roadway and the railway above. Progress for the remainder of 2018 is expected to include “advancement in the preliminary design, alternatives analysis, stakeholder meetings and public involvement.” Public involvement will include an open house and public hearing later this year. Construction is not expected to begin before 2022. Improvements to East William Street are also detailed in the report. The improvements include widening the street to include a center turn lane from Potter Street to just east of Foley Avenue, while enlarging the intersection of William and Lake streets. At an estimated total cost of $4.25 million, which is subject to increase, most of the project will be paid for through federal funding. The city will chip in $600,000, although, again, the city will look to secure additional funds to lower that number. It is anticipated construction will begin in spring of 2019 and would only take one construction season to complete. Another project included in the CIP is the repairing of the Springfield Branch pedestrian bridge that extends over U.S. Route 23, the Olentangy River and River Street. The two cement piers on U.S. 23 are deteriorating and repairs are needed to prevent further deterioration and concrete from the bridge from falling onto U.S. 23. The report estimates the repairs will cost around $150,000, but notes a more accurate estimate will be available early next year. The city is also weighing the cost-effectiveness of the repairs against replacing the entire bridge with a new structure that would be similar to the pedestrian bridge that was constructed in Orange Township. The full CIP report can be viewed by accessing the agenda for the Oct. 8 meeting, which can be found on the city council page under the departments and services tab on the city’s website.